I'm not sure why, but purple has always been a color of mystery and the mystical to me. Maybe it has something to do with associating it with the amethyst stone, which is very prominent in many cultures as well as the pagan community as a stone filled with mystical powers. 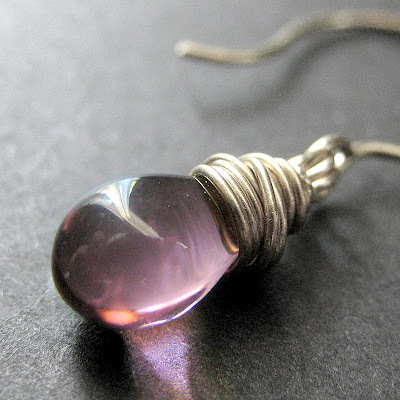 In these handmade teardrop earrings, tiny transparent glass teardrop briolettes dangle in a shimmer of purple that has been carefully and securely wrapped with silver wire. The drops are then set to dangle on delicate matching silver tone hooks designed by hand for a unique and graceful shape. These 1.2-inch (3.3cm) earrings are made with care to be light-weight on pierced ears and easy to wear and are part of a growing series of earrings named "The Elixirs". The moment that I saw this beautifully detailed pendant, I knew I had to work with it and I'm in love with the results! 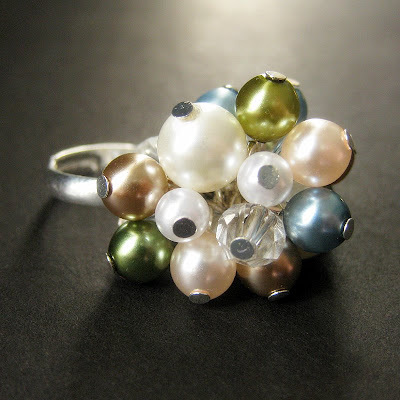 This item is a unique OOAK (One of a Kind) piece. 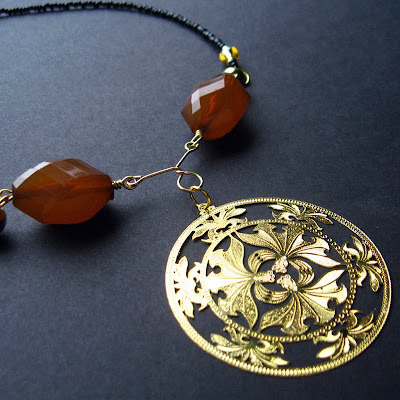 The intricately stamped filigree pendant is accented to perfection, dangling beneath a delicate wind of gold wire and earthy brown beads and golden accents complete the piece. This beautiful handcrafted necklace is perfect for making an elegant statement on a casual outfit or accenting a dressier style. The lobster claw clasp at the nape of the necklace hooks to a chain that allows this necklace to be worn tight enough to be a choker or loose enough to lie against the chest while a small bead bauble at the end of the chain gives an extra bit of decorative touch. Necklace length adjusts between 16" - 18.5" in length (40.5 cm - 47 cm). 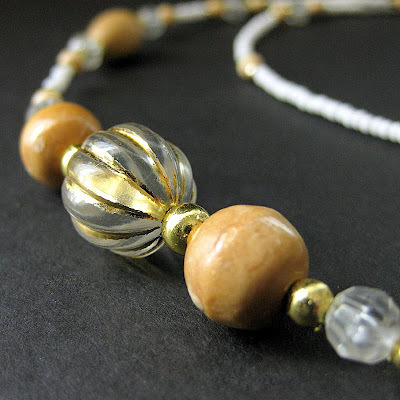 The light pine beads used in this strand are combined with golden accents to create a hint of warmth on this fully beaded eyeglass chain. The white and clear beads that complete the look give a clean and style perfect for every day wear or something more fancy like an evening out. Like all of our eyeglass holders, this 29.75-inch (75.5 cm) strand is made with smooth beads at the nape for the comfort of the wearer and decorative beads at the ends to show off a sense of style while keeping eyeglasses easily in reach.